The BJP today wrested the communally-sensitive Muzaffarnagar constituency in Uttar Pradesh where the Samajwadi Party suffered a blow losing two of the three seats it had while the Congress was jolted in Karnataka where it lost two of the three seats in the Assembly by-elections. The ruling RJD-JD(U)-Congress coalition, which had come to power in Bihar with a massive majority in the Assembly elections three months ago, faced an embarrassment when the Congress candidate was defeated in Harlakhi constituency by BJP ally RLSP. In the other five states, ruling parties—BJP, Shiv Sena, Akali Dal, TRS and CPI (M)--won in the by-elections for a lone seat in Madhya Pradesh, Maharashtra, Punjab, Telangana and Tripura respectively. 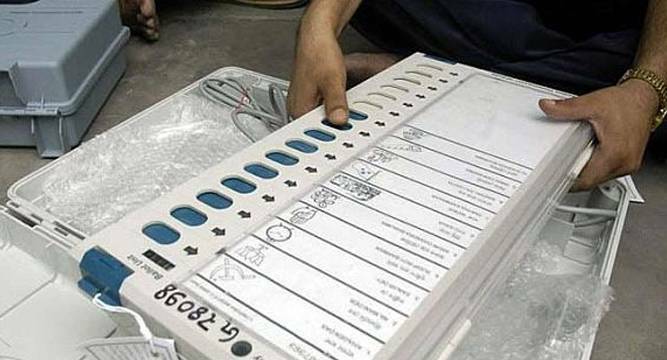 The by-elections were held for 12 seats across eight states, results of which were declared today. Uttar Pradesh, which is headed for Assembly elections next year, handed out a drubbing for the Akhilesh Singh government when the ruling Samajwadi Party lost in Muzaffarnagar and Deoband. The party, however, retained the Bikapur seat. Muzaffarnagar, where BJP’s Kapil Dev Agarwal defeated SP’s Gaurav Swarup by margin of 7,352 votes, is considered a test case for the saffron party which had mounted a strident campaign on Hindutva issues ever since the communal riots of 2013 there. In Deoband, the seat of Islamic religious school, Darul Uloom, the Congress worsted the SP when its candidate Mavia Ali defeated Meena Rana. The ruling SP managed to retain the Bikapur (Faizabad) seat when its candidate Anand Sen Yadav defeated RLD candidate Munna Singh Chauhan. The opposition BJP in Karnataka, where Assembly elections are due in 2018, got the better of the ruling Congress in a virtual direct fight when it retained Hebbal seat in Bangalore. But the two parties snatched each other’s seat in Devadurga and Bidar. The results in Karnataka are seen as a blow to Chief Minister Siddaramaiah considering the fact that the Congress had invested heavily in the contest to wrest seats from BJP. The Congress casualty in Karnataka included C K Abdul Rahman Sharief, grand son of former Railway Minister C K Jaffer Sharief, who lost to BJP’s Y A Narayanaswamy by margin of 19,149 votes in Hebbal. Sharief was given the ticket at the last minute against the wishes of Siddaramaiah who had plumped for his favourite Byrathi Suresh, an MLC, as the candidate. In Bidar, Congress’ Rahim Khan triumphed by a margin of 22,721 votes, defeating his closest opponent Prakash Khandre of BJP. K Shivana Gouda Nayak of BJP defeated A Rajashekhra Nayak of Congress by a margin of 16,871 votes in Devadurga. The grand alliance in Bihar suffered a setback when Sudhanshu Shekhar, a candidate of the RLSP headed by Upendra Singh Kushwaha, defeated his Congress rival Mohammad Shabir by a margin 18,650 votes. Dealing a blow to the Congress in Madhya Pradesh, ruling BJP won the Maihar Assembly seat with party nominee Narayan Tripathi defeating the main opposition party’s Manish Patel by a margin of 27,544 votes. Tripathi secured 82,703 votes while Patel polled 55,159 votes. The outcome came as a double jolt for Congress as Tripathi, after winning the seat in 2013 Assembly polls, had quit the party to join BJP during the 2014 Lok Sabha elections. Later, he resigned from the seat which necessitated the by-poll. The victory came as a morale-booster for the BJP after it conceded to the Congress the Jhabua Lok Sabha seat in a by-poll shortly after the drubbing in the Bihar Assembly elections, which analysts then took as a sign of declining fortunes of the long-ruling saffron party in the state. In the neighbouring Maharashtra, ruling alliance partner Shiv Sena retained the Palghar Assembly seat as its candidate Amit Ghoda defeated his nearest Congress rival Rajendra Gavit by a margin of 18,948 votes in a keen contest. In Punjab, which also goes to polls next year, the ruling SAD won the by-poll to Khadoor Sahib Assembly seat, with party candidate Ravinder Singh Brahmpura defeating his nearest rival Independent candidate Bhupinder Singh by a margin of 65,664 votes. Main opposition parties Congress and Aam Aadmi Party had stayed out of the contest. In Telangana, continuing its winning spree since it rode to power in the 2014 Assembly elections, the ruling TRS wrested Narayanakhed seat in Medak district from Congress with a massive margin of over 53,625 votes. TRS candidate Bhupal Reddy polled 93,076 votes, while Congress’s P Sanjeeva Reddy secured 39,451 votes and the TDP nominee Vijaypal Reddy, brother of Bhupal Reddy, got only 14,787 votes. Tripura saw the ruling CPI-M winning the Birganj Assembly by-election in Gomati district, with party candidate Parimal Debnath trouncing his nearest rival BJP candidate by a margin of 10,597 votes. While Debnath secured 20,355 votes, BJP’s Ranjit Das polled 9,758 votes. Congress candidate Chanchal De got only 1,231 votes and his deposit was forfeited.